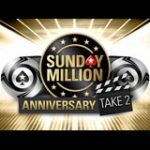 PokerStars Sunday Storm is the new title for the Sunday 1/4 Million, to celebrate the new name change, PokerStars are guarantying a million dollar prize pool on 27 March 2011. Players can buy-in directly to the weekly online poker tournament for just $11, with qualifiers and PokerStars freerolls running daily. Make your first deposit at PokerStars and get a free tournament ticket to play the PokerStars Sunday Storm, plus a 100% first deposit bonus up to a maximum of $600. 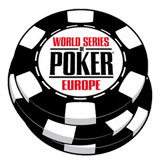 Play in the Pokerstars Sunday Storm tournament for free and win your share of the $1,000,000 Guaranteed prize pool on 27 March 2011. 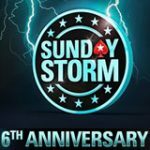 Use PokerStars bonus code STORM when making a first deposit to get your free ticket to the Pokerstars Sunday Storm worth $11, PokerStars minimum deposit $20. 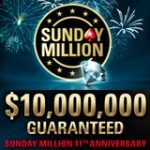 All free tournament tickets issued to first depositors are only valid for first ever Sunday Storm every Sunday thereafter the prize pool will return to $300,000 guaranteed. 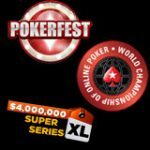 The prize pool has only been increased for this one time only re-launch of the weekly online poker tournament, for only $11 players can play one of the best value poker tournaments online. Don't miss your shot at a million dollar prize pool. 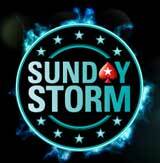 Download PokerStars and get 100% first deposit bonus up to $600 plus free entry to the Pokerstars Sunday Storm. There are 3 ways to get your seat to the Pokerstars Sunday Storm, players can Buy-in directly for only $11, make your first deposit to get a free tournament ticket or qualify in the daily satellite tournaments and freerolls. 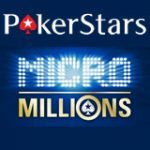 Players can win their Pokerstars Sunday Storm seat or free in the daily PokerStars freeroll tournaments which take place every hour, players may enter these events for free with no deposit required to join. 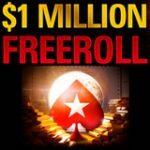 Win your seat in the freeroll where the top 10 players get to play for a million dollar prize pool.